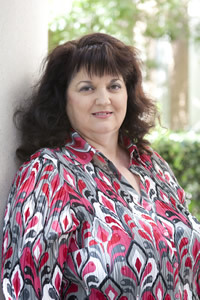 Ginger Robertson was first employed at Samford University in April 2005. She served as a temporary secretary for Charles DeBow in Cumberland School of Law before transferring to Brock School of Business in 2006 as administrative assistant for the Department of Entrepreneurship, Management and Marketing and the Executive Education program. Prior to coming to Samford, Ginger worked for nearly 10 years at Media Services, a subsidiary of Southern Progress Corporation, as a customer service representative in both the magazine and book divisions. Ginger also served as a secretary in Southern Research Institute's maintenance department for more than 10 years. The knowledge that Ginger gained from these positions has served Brock School of Business well. Ginger majored in accounting while attending Bessemer State Technical College. Ginger has a son, Kyle (Fallon), who is employed with Birmingham Water Works. Ginger has two grandchildren Jensen and Emery. Ginger currently lives in McCalla.